PITTSBURGH - March 6, 2017 - PRLog -- . In biotechnology, chemical reactions are initiated by changes in the positions of the atoms caused by the vibrational excitation of molecules. In small molecules, control over photochemical processes are known to be mediated by excitation of vibrational modes aligned along the reaction coordinates, but in polyatomic molecules the selection of the reaction coordinate is difficult because of the high density of vibrational states creates a complex PES landscape. PES stands for potential energy surface. Typically when a molecule is heated, all atomic motions are excited simultaneously. However, the RIXS method  shows the X-ray photon energy may be tuned to excite vibrations of a type of atomic motion, e.g., tuning X-ray photon energy in resonance with one selective state induces symmetric stretching motion; while tuning to another state excites the bending motion. This is significant, but not for showing stretching and bending vibrations initiates certain molecular vibrations. The significance of  is chemical reactions need not be initiated by temperature, but rather by X-ray emission. Similar to RIXS, X-rays produced in heating atoms induce vibrational motion to initiate chemical reactions is an attractive alternative to temperature driven atomic motion, especially if temperatures cannot occur. Heating of atoms in molecules is proposed to create X-rays instead of increasing temperature. MD based on the classical equipartition theorem is thereby superseded by QM that by the Planck law denies the atom the heat capacity to increase in temperature. QM stands for quantum mechanics. The thumbnail depicts colloidal gold atoms heated in a thermal bath communicating with each other by X-rays. Of importance, X-ray emission by atoms makes MD simulations  based on the equipartition theorem problematic. MD stands for molecular dynamics. Based on classical physics, MD assumes heating a molecule increases the thermal energy of the atom that is converted to its momentum causing the vibrational motion of atoms. But QM governs nanoscopic motion and not classical physics. Simple QED creates X-rays having Planck energy E = hν. Here, h is Planck's constant and ν is frequency, ν = (c/n)/λ = c/2nd, where c is the velocity of light and n the refractive index of the atom. At X-ray frequencies, n = 1. Hence, colloidal gold atoms having d = 288 pm produce X-rays having E = 2.2 keV. Since QM precludes atom temperature changes, the equipartition theorem is no longer valid. The heat flow Q into the atom from the thermal bath at the metabolic temperature To = 40 °C is conserved by producing 2.2 keV X-rays. The colloidal gold atoms have thermal conductivity K = 318 W/m-K and radius Ro = 144 pm. The atomic nucleus is assumed to have radius RI = 1x10-5 Ro. The number N of X-ray photons produced in time τ is shown in the thumbnail. 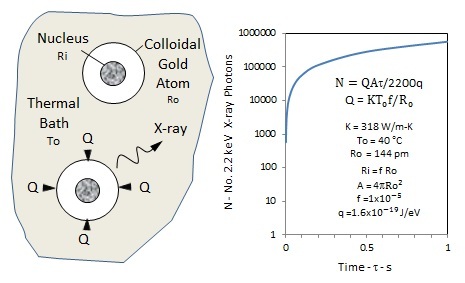 At body temperature, a colloidal gold atom produces a single 2.2 keV X-ray photon in a few microseconds. X-ray excitation by RIXS offers a novel method for controlling chemical reactions, but more fundamentally suggests atoms in molecules heated in a thermal bath interact with each other by X-rays and not temperatures. Traditional MD based on the equipartition theorem of classical physics is not valid in deriving atom motions and needs modification for the vanishing heat capacity of the atom required by QM. R. C. Couto, et al., "Selective gating to vibrational modes through resonant X-ray scattering," Nature Communications, 8, 14165/DOI: 10.1038/ncomms14165. M. P. Allen and D. J. Tildesley, Computer Simulations of Liquids, Clarendon Press, Oxford, 1987.